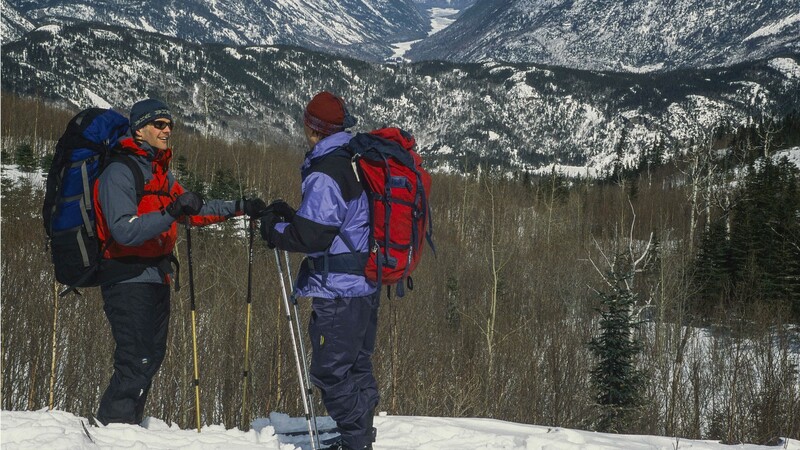 We venture into Quebec’s wilderness on a five-day backcountry ski trek along the Charlevoix Crossing. When a friend invited me on a five-day backcountry ski trek in Quebec this past February, I said yes right away. I probably should have thought about it more carefully, since I’m not much of a skier, and I definitely wasn’t prepared for marathon days in the bitter cold. But I have found that a glib approach to potential suffering is a good way to get into an adventure. It turns out I was right. Air Canada flies non-stop from Pearson International Airport to Quebec City’s Jean Lesage International Airport multiple times a day (about $300 round trip for a 90-minute flight). From there it’s a 90-minute car ride to the beginning of the Charlevoix Crossing. 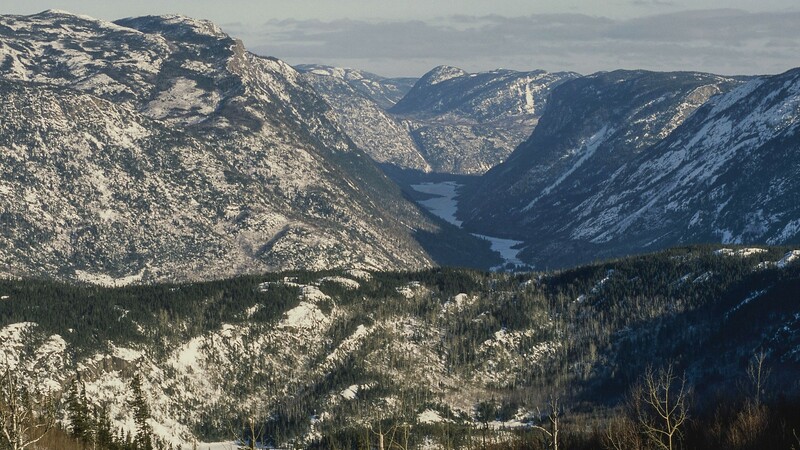 Our destination was the Traversée de Charlevoix (in English, the Charlevoix Crossing), a 105-kilometre odyssey through a 457,000-hectare World Biosphere Reserve that links Grands-Jardins national park to the Mont Grand-Fonds ski resort area. This trip is a serious undertaking, as gruelling as it is glorious. It took me deep into an icy wilderness, to a place of stark beauty and very little comfort. I found my limit waiting for me out there, both physically and emotionally, in many moments of utter exhaustion: hunched over my ski poles, contemplating my aching feet as I panted clouds of mist into the frozen air and listened to the trees creak in the cold wind. I should have hated every minute, but by some weird magic, it was euphoric. The Traversée de Charlevoix lies just barely inside the range of the possible for someone like me, who usually prefers exercising in close proximity to a shower and a sauna. So I was grateful to embark on the journey with a group of experienced backcountry skiers, as should anyone who wants to try the Traversée. A wrong turn or a broken leg could have turned my endorphin-boosted winter adventure into a biting Siberian nightmare. But the group helped to steer me away from rookie mistakes and helped me find my inner snow-monster when the going got tough. When it came to schlepping my gear, however, I was on my own. It was on our first day on the trails that I quickly discovered how skiing with a heavy backpack is its own art form. After struggling through the snow all day, I slowly lost the will to bend my knees. But straight-legging a curvy descent through the woods is a mistake. Not only did the backpack add an extra whomp to my falls (there were many), it also dramatically complicated standing back up. On several occasions, I found myself grunting and lurching around like a drunken walrus, while my companions plowed obliviously forward. I was grateful to have reached our first chalet after a full day on the snow. The Traversée de Charlevoix offers rustic chalets every 15 or 20 kilometres, and they’re equipped with a wood-burning stove, a few rough-hewn tables, stacks of single mattresses to throw under our sleeping bags and plenty of hooks to hang our sweaty clothes to dry overnight. The buildings definitely aren’t pre-heated, which made for a chilly transition from wet daytime attire to dry sleepwear. My body steamed like a kettle when I stripped: an experience both disturbing and gratifying. Recharged after a solid night’s sleep, we hit the slopes to continue our journey. 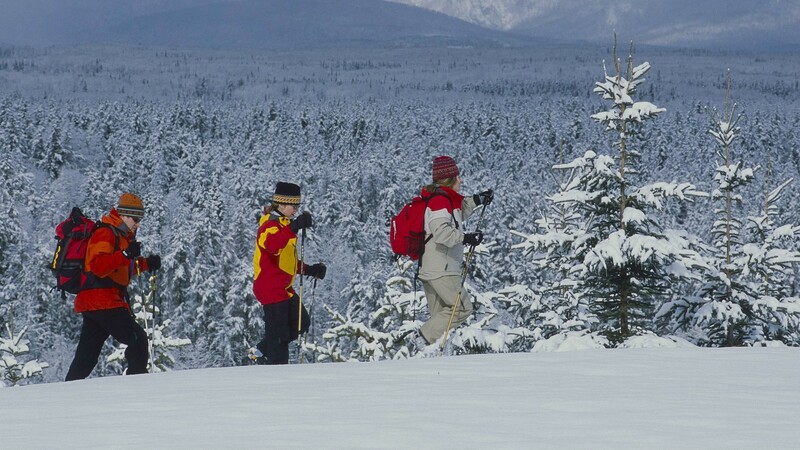 The Traversée de Charlevoix has several types of trails, which are marked for their summer and winter uses. The ski-path might be used by hikers in the warmer months. These parts of the trail are narrower and carve through difficult-to-reach places. Other portions of the ski path overlap with summertime bike trails, which are wider and used by Ski-Doos in the winter. (Get ready to jump sideways if you’re sharing the route with Ski-Doos – they come roaring up quicker than you’d think.) The trail is well-signed in most places, with markers on trees every hundred metres or so, but we still relied on a map to navigate. There were a few times when the different trails crossed and we almost took off in the wrong direction. The tracks of recent skiers helped to guide us for the first two days on the trail. But on the third day, the previous group must have quit or turned back because the trail was no longer prepared for us. We found ourselves cutting through thigh-deep snow, and our pace slowed dramatically. Skiing through pristine, untouched snow is a hell of a lot harder than skimming along on a nicely groomed cross-country trail, as we soon discovered. Often, it was like wading upstream against a fast-moving current. We took turns in front and switched out frequently, but even with lots of short breaks, it was brutal work. 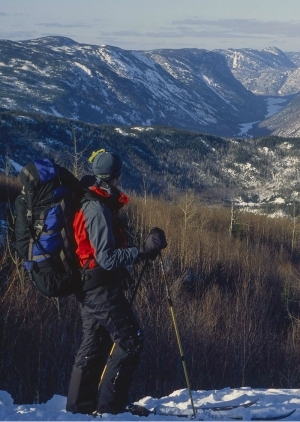 Backcountry skiing combines elements of cross-country and downhill skiing and its skis are designed for all types of terrain. They’re a bit shorter and wider than cross-country skis and the boots are stiff like downhill boots, but they still lift at the heel. Backcountry skis also use “skins” that attach to the bottom for traction to prevent you from sliding backwards when you’re climbing uphill. Traditionally, these would have been taken from seals, but contemporary skins are manufactured. The skins also serve to slow your descents, in case face-planting a tree seems like a genuine risk, as it usually is along the Traversée de Charlevoix. Expert backcountry skiers remove the skins when going downhill, but if you’re zigzagging down a mountainside through a thick forest, you don’t want to miss any of those sharp turns. I kept mine on. Out in the snow and far away from civilization, I discovered a truth about myself that was easy to forget in day-to-day life: I am an animal, a thing of feeling and flesh more than thoughts and concepts. I felt it when I wobbled into the chalet at the end of a long day and started nursing my blisters and aches. I found I could stretch contentedly for hours, with nothing else on my mind except pain and relief. I also felt it when I lay down like a dog and slept. But I felt it most when it came time to eat. Back in the city, I’m a bit choosy about my diet. I’m not fussy, but I do think pretty carefully about what goes in my body, and I try to make it interesting for myself. On the trail, it was a different story. I got right down to the hard math: food equals energy. Everything I ingested had a single purpose; to keep my body moving. The positive trade-off for entering this animal-like condition was that everything started tasting pretty good. At the end of our third day on the trail, one of my companions offered me a frozen anchovy, which normally might have made me want to vomit, but I gobbled it up like a Chicken McNugget. 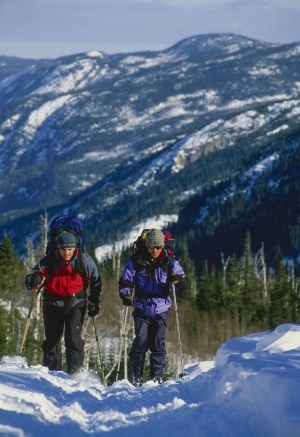 More than the straightforward two-step through the snow, backcountry skiing is a dance of body heat. The days were marked into intervals of hot and cold: the steady warmth of physical exertion, punctuated by the brutal chill of standing still in sub-zero temperatures during breaks. I found that the best way to cope was to bring several thin layers and constantly dress and undress myself. When I was skiing, a wool undershirt and zip-up sweater sufficed; then, during a pause, I would pull on a sweater and a down jacket if I needed to. Expert skiers work with their pace and clothing in order to sweat as little as possible or not at all, but some of us don’t have that option. I’m a walking water bomb. I sweat profusely when I exercise, no matter what. The Traversée de Charlevoix is hard work, so for me, there was no way to avoid getting wet. This brought a surreal edge to my experience of the trek. I remember after a particularly punishing stretch on the fourth day, it felt like I’d taken a shower in my winter clothes and then stepped out into an icy forest, with temperatures below -15 degrees Celsius. It was a dangerous position to be in – soaked in sweat, I didn’t have to stand still for very long before my body temperature started plummeting. While we brought heat-reflective emergency blankets and had dry clothes in our bags, in case we absolutely needed to stop, that was a worst-case scenario. But I knew that the only way to finish the day was at the chalet. So I gobbled another energy bar, swallowed a few gulps of water and kept plunging forward. On the final day of the trip, we weren’t able to reach the end of the trail before nightfall. Stupidly, my headlamp wasn’t working, so when dark descended, I had to rely on the lights of my companions. When it was my turn to break the path at the front of the group, I was illuminated by the person behind me. Their light cast my body as a giant shadow on the path ahead. It looked like a great beast was thrashing through the woods in the dark, but it was just me. Though I was exhausted and desperate to rest, I watched that powerful, Yeti-like version of myself leaping ahead of me and it made me feel strong. Given the intense difficulty of a trip like this, I often wondered, why do it at all? It’s hard to explain what it feels like to move quietly along a frozen stream in the early morning, or to make a fast descent down a narrow trail through an evergreen forest. You just have to put on your gear and go. There’s no other way. There were moments out there that could never have existed unless I left my normal life and entered the wilderness. They were more like visions than stories: standing under a luminous sky swirling with snow and gazing out over a wintery, wind-blown valley. My heart was beating hard. I was cold, but I was okay. Though my legs were brutally sore, I no longer wanted to stop at all. I only wanted to coast in that strange, low-grade exhilaration that comes from steady effort and forward motion, one foot in front of the other, all the way to the trail’s end.